Are you losing too many of your best performers? Are you spending too much time on your underperformers? 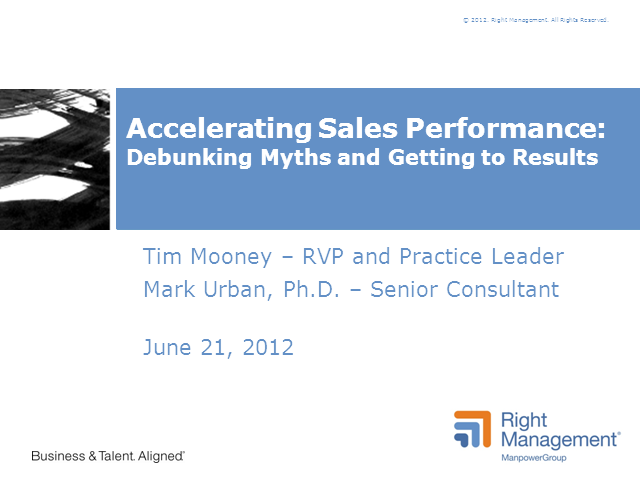 Are your sales leaders frustrated with performance issues? Your salesforce is the lifeblood of your organization. The more revenue they bring in, the more your organization can grow. •We can help with all of this! As the talent and career management experts within ManpowerGroup, Right Management works with over 80% of the Fortune 500 and has experience in aligning organizations’ talent strategy with their business strategy to accelerate performance. If you’re having difficulty attracting and keeping the talent your business needs, you’re not alone. According to a Right Management survey, 46% of all U.S. employers cannot find the talent they need, and 38% of employees surveyed said that career opportunities are the reason why they are staying with their current employer. A successful leadership program not only helps ensure bottom line growth; it’s an important factor in attracting and retaining top talent. Please join us Wednesday, October 24 at 12:00 CT to learn how Benjamin Moore engaged some of its emerging leaders in the company’s first leadership development program. This pilot focused on skills the company wanted to strengthen in its culture so it could deepen its leadership bench. These included strategic thinking; cross-functional communication and collaboration; innovative and critical thinking and influencing others at all levels. Join us for our final Lunch & Learn webinar of 2018 as Lisa O’Loughlin, Senior Manager of Corporate Learning and Development at Benjamin Moore, joins Right Management’s Robin Silverman to share insights you can apply and business gains to inspire you from this impactful program. It’s clear that converging economic, technological, and demographic changes are creating talent challenges for organizations, leaders and individual contributors. Skilled individuals, particularly those in short supply, have greater leverage to dictate terms of employment to their potential employers—how, where and when they want to work. So, how does an organization engage such an employee while meeting its own business objectives and goals? The answer lies in building a coaching culture. While meaningful work connects employees to an organization and its success, it is not enough. To foster deeper engagement and productivity, that work has to be embedded in a culture that invests in employees’ development, enables learning and empowerment, and supports individual accountability. Creating a coaching culture that encourages learning and development will help an organization attract, engage and retain the brightest talent, while also encouraging all employees to take charge of their careers. In this webinar we will provide insights into the journey toward building a coaching culture including a model to better understand where you are in this journey, best practices for building a culture, and practical recommendations. To bring this to life, we have a special guest from Procter and Gamble who will be sharing highlights from the organization's own cultural transformation journey including decisions around how and where to build coaching skills internally as well as when to leverage external coaches. We look forward to having you join this thought-provoking webinar! Recent trends in the world of work are placing extraordinary demands on the ability of organizations to quickly evolve. Talent is at the heart of this evolution and is widely recognized as the key differentiator. Identifying and preparing high potentials is critical, but development programs need to focus on more than leadership. Making career development and mobility an integrated part of your process is the key to driving the most value from your pipeline development efforts. Effective leaders create high-trust cultures for their organizations and teams. People who are confident their leaders will treat them and their ideas without bias bring their best to work every day. Yet unconscious bias – automatically treating people differently depending on how much they’re like or unlike us in terms of age, experience, gender, ethnic and cultural background, and the like – is inherent in being human. During this webinar, we’ll learn why unconscious bias happens, how it impacts individuals, teams, and organizations, plus what leaders can do to overcome these biases and create a work environment that values diversity and inclusion and makes the world a better place to live and work. Right Management is bringing together our top talent and career experts in a fun and engaging webinar: Ask the Global Career Experts. Our consultants will share their top 2017 talent tips and trends, and answer your workforce questions. Organizations are increasing digital strategies, practices and offerings but they aren’t always sure what it means to really “be” digital and what are the lasting benefits. Most are encountering challenges. This webinar will provide insights into how to see “Digital” as a holistic business and organizational effectiveness strategy and how to identify where your business is on the journey to achieving lasting digital benefits. The enablers and capabilities required to lead the next generation of Industry. The transition from automation to digitization is here, and the march to industry 4.0 has already begun. What kind of leader will be needed to lead digital transformation in organizations across all domains? Regardless of the digital leader type, title or specialty, all of these leaders must possess enhanced responsibilities and perspectives. We’ll also share how you can assess capabilities of future leaders and identify development opportunities through the five key lenses through which digital leaders view every aspect of their jobs. A key takeaway is the opportunity to determine where your succession needs, development programs and leadership pipeline can benefit from a focus on these targeted leader capabilities for success in the digital era. As competition for talent continues to grow increasingly fierce and voluntary turnover rates are on the rise, a new reality has recently emerged in the mindset of the modern workforce: Career Management is extremely important to individuals and is gaining importance as a key deciding factor of whether talent will stay—or leave—an organization. Employees now expect employers to provide them with opportunities to help develop their careers. And they will seek it from other organizations if their current employer does not meet this need effectively. Right Management recently conducted research on the importance of career and uncovered that CAREER is increasing as the primary driver of employee retention and engagement. The world of career management is changing. Is your organization ready? Manufacturing continues to evolve. For small companies and large enterprises, the digital transformation beckons brightly, capturing broad attention and commanding major initiatives. Few will escape the challenge of digital transformation. Most hope to embrace it. Right Management and ManpowerGroup have been at the forefront of researching the impact of digital transformation on manufacturing. We are the workforce strategy partner for the Digital Manufacturing & Design and Innovation Institute, one of the Manufacturing USA institutes which were put together to make US manufacturing more innovative and globally competitive. As the workforce strategy partner, we have worked with the Institute and its members to identify the implications digital transformation has for critical roles & skills of the future, leadership transformation and culture change, and how to productively approach change management. In this briefing for WMC members, DMDII and Right Management will walk you through how manufacturers in Wisconsin can take a significant leap forward. Did you know that research shows that high potential (HIPO) talent is the critical business differentiator in the Human Age? And, that organizations who successfully identify and develop high potential leaders gain measurable financial performance advantages over their peers? Despite the best intentions, many organizations sabotage the success of their high potential programs by not thinking through some of the basic processes associated with candidate selection and ongoing strategic development. As a result, key talent in the organization may become discouraged and disengaged – and your investment of time and resources in their growth may not deliver the return you expect. + integrating time-tested best practices in executing a highly experiential HIPO Architecture. Traditional one-on-one executive/leadership coaching has proven to be a highly effective tool in developing talent for the ever-increasing challenges in organizations. But the traditional approach is not the ONLY way to use coaching. Development of your most promising employees earlier in their careers is necessary if we are to have the leaders required for companies to compete in the future. Large classroom training alone isn’t getting results quickly enough for this emerging talent pool and is not focused specifically on what individuals need. Pulling coaching into the “development mix” moves companies in the right direction… but it has to be configured properly for the audience. Please join us in conversation as we welcome Sharon A. Johnson, Director, Executive Development at Nationwide where they are incorporating creative approaches to development by adding “right-sized” coaching elements to various leader development programs and getting results. Assessments play a critical role in identifying and developing the talent needed to survive in today’s rapidly changing environment, but the landscape of assessment providers is growing exponentially – with corresponding risks. Making sense of these changes is difficult for even the most savvy HR teams. + Do gamified tools provide additional benefits? + Should we throw out tried and true best practices in favor of newer assessment concepts? + How can investments in assessment be made wisely – providing rigor while also maintaining employee engagement? Cutting through the noise in this complex environment requires an evaluation of your assessment options. What employees want related to Career Development and the critical importance of career conversations in light of emerging workforce trends. What you don't know about your talent could be hurting your organization; learn more about ways to assess your talent and focus career development efforts. The high potential talent in your organization can positively impact your organization’s success both now and in the future, but not engaging and developing them NOW can mean a loss of effectiveness and possibly losing them to competitors. Join us to learn how to accelerate their careers and hasten their impact on your organization! Your leaders need the skills to provide coaching and guidance to empower their employees to navigate career development options within the organization. Learn tips and tricks on how to make your leader development more effective! Success profiles provide a roadmap to help organizations and individuals define what success looks like as it relates to career development and talent mobility. If your organization isn’t using these, you could be wasting time and money. Join us to learn more about success profiles and how to incorporate them at your organization! Join us for a 10-minute webisode to learn best practices on outplacement and organizational re-alignment! Precipitous drops in oil processes and prices have resulted in declines in drilling and exploration, causing a round of layoffs to be announced by those hit hardest in the downturn. Earnings are down for companies that have made record profits in recent years, forcing them to decommission rigs and sharply cut investments in exploration and production. Challenges related to commodity price shifts coupled with the impending retirement of senior leaders and skilled workers is forcing smart organizations to consider how they weather the downturn while still investing in talent development. How can leaders prevent the creation of supply gaps that will hinder their ability to take advantage of longer term energy innovation and sector growth? Our thought leaders have over 30 years of experience building and delivering innovative talent strategies, development programs and outplacement services across the globe. Join us to hear them share their insights and recommendations for your organization. Right Management is a global leader in talent and career management workforce solutions within ManpowerGroup. The firm designs and delivers solutions to align talent strategy with business strategy. Expertise spans Talent Assessment, Leader Development, Organizational Effectiveness, Employee Engagement, and Workforce Transition and Outplacement. With offices in over 50 countries, Right Management partners with companies of all sizes–including more than 80% of the Fortune 500–to help grow and engage their talent, increase productivity and optimize business performance. Our webinars connect you to leading experts who deliver the latest insights on topics to better align your talent strategy with your business strategy.